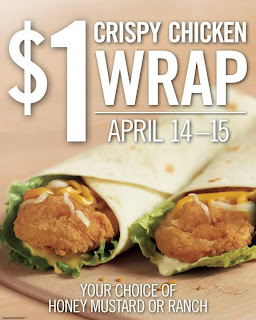 $1 Crispy Chicken Wraps at Burger King! The lottery says all you need is $1 and a dream…we say all you need is $1 and your appetite for a tasty treat!Come to BURGER KING® this weekend to try a NEW delicious Honey Mustard or Ranch Chicken Wrap for just $1 each on April 14th-15th only! Price and participation may vary. Not valid in AK & HI. I'll be getting a few, will you? !